10 Oct Our Pruning Perennials Guide! In case you haven’t noticed, I can sometimes have a laissez-faire attitude when it comes to gardening. It has been pointed out to me that I’m much better at telling others how to garden than I am at taking my own advice. The truth is as much as I love my garden, I also love to travel, to cook and to drink wine and I only have so much time in my days. I don’t mind leaf litter scattered around, and I leave my sunflowers standing for far too long with the hope of feeding some finches, or at least that’s the excuse I give when a garden guest has the gall to comment on them. Most of the plants in my garden were picked up as throwaways from job sites or rescued from the garden center. My garden of benign neglect came about it’s Darwin style survival technique because I bring plants home than I will never have room for – or time to care for! But even though I trust that the plants in my garden know what they’re doing and don’t need much help beyond proper planting, mulching, watering and fertilizing, I know that I have got to prune back my perennials. Part of that reasoning is selfish; I genuinely love crawling around in the mulch and soil with my pruners and soil knife, snipping back perennials and investigating for new growth and funky critters. It’s the third generation farmer in me, I just find it relaxing and truly enjoy it! Another more pragmatic reason for pruning back these beauties is very simple: it’s healthy for the plants. 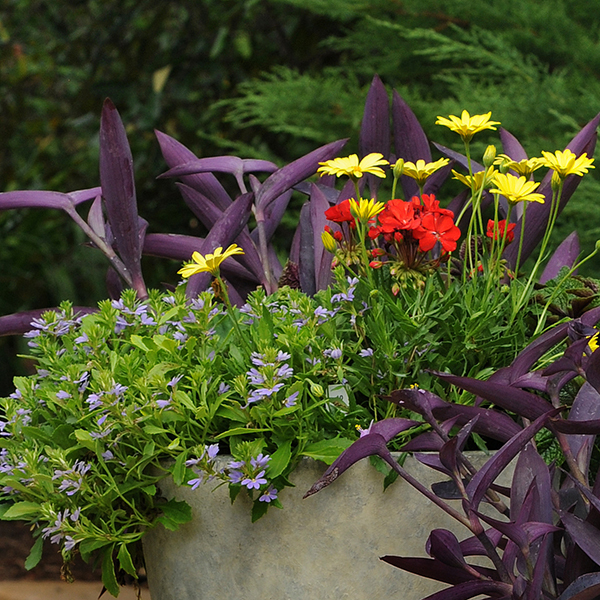 Leaving around dead or dying foliage is bad news for our garden treasures. We might as well put up a sign inviting fungi and disease to move right into our gardens. Some perennials benefit largely from regular pruning during the summer growing season, but the most important cleanups are the ones done in the fall and the spring. A host of perennials respond best to a tidy spring cleaning and are rejuvenated from the practice. Other perennials favor a quick cutting-back before winter sets in, so that they can get right down to business in the spring, unimpeded by last year’s growth. The trick to doing this the right way is to know when to cut what – and that’s what we at Lakeview have prepared for you to read today. A healthy guide to what to cut back in the spring and in the fall follows here, so save this email and revisit it when you need to reference it! There are some basics you’ll need before jumping into pruning. A good sharp pair of snips or pruners is essential – trying to saw through stems with sheer force of might isn’t healthy for you or for your plants! A good pair of gloves makes a big difference too because no one wants war wounds otherwise known as blisters. Plants that produce a bazillion (with a B) seeds are eager to multiply in your garden without the courtesy of an invitation. For some plants this can be desirable, but other plants tend to become aggressive growers, invading areas of the garden where they aren’t welcome and produce just more work for you if not handled properly now. Leaving certain seed heads attached for too long increases your odds of finding new patches of your favorite (or not) self-seeding plants. Examples of these prolific volunteers would be Cleome, Fennel and even Rose of Sharon. We aren’t talking about you favorite of the herb served with tomato and mozzarella here! Instead, “basal growth” refers to the leaves, shoots, and stems that start growing from the very base of the plant. 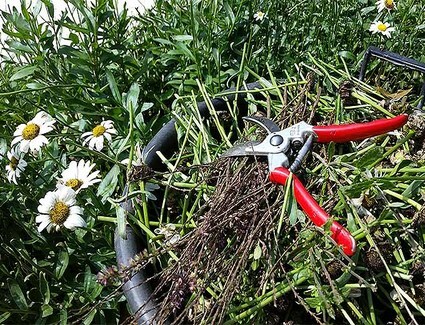 Some perennial cutback advice suggests “pruning back to the basal growth,” which simply means leaving a few inches of last year’s growth standing when you cut back the perennial. Composting is a highly desirable skill and practice for gardeners. Having said that, when it comes to cutting back perennials, it is best to dispose of the old growth you’ve removed from the plant rather than composting it. This old foliage can harbor fungal problems and disease and it’s best to destroy, rather than trying to compost it and possibly contaminating your compost. A hard frost is one of the earliest signs of fall, and also early springs final goodbye to winter. Four or more hours of below-freezing temperatures qualifies as a “hard” frost. It usually causes most perennial plants, annuals, and vegetables to die back to their roots. It can be difficult to pinpoint when the last hard frost will take place, but pay close attention to the weather forecast – and remember that patience is the gardener’s best friend. Your trusty garden pruners are a great option, along with a pair of sharp shears or scissors for finer foliage cut backs. A soil knife can be an indispensable tool when it’s needed. Whats a soil knife you ask? Basically a soil knife is a serrated knife that can saw its way through roots and compacted soil. When my dad would to install big sod lawns all the serrated steak knives in our kitchen would disappear. I have many memories of eating steak from the grill with a butter knife and asking where the sod install job was that week! A spray bottle filled with straight rubbing alcohol functions as a handy and quick sterilizing spray when pruning, helping to prevent the spread of disease and fungal infections. Keeping your tools clean is the easiest way to prevent the spread of diseases and fungus. Alec, Angela, who have recently started calling themselves the double AA batteries of Lakeview and I have put together this list of the most common plants we get questions on. If fungal growth had a haven, it would be the leaves of an iris. Not sure if it’s time to cut back those irises? Also known as German iris, cut these back in the fall to minimize fungal problems and garden pests. August is always best month because that pruning allows adequate time for new root and shoot growth to establish before a hard freeze. A contestant in the running for “Most Possible Mildew on a Perennial” (an award that no one wants to win) is beebalm. We love them and there are several new mildew resistant varieties but none are mildew proof! Have beebalm? Wait until fall, and then cut these to the ground. One of my personal favorite perennials, blanket flowers are easy to prep for winter. If you like a tidy garden, cut back the flower stalks in late fall. But if you don’t mind their presence in the garden, you can leave them until next year. Blanket flowers are sensitive to soggy soils, so avoid mulching them over the winter. I know, you can’t believe I just told you NOT to mulch something! I’ve got a love-hate relationship with catmint. It’s a fantastic plant for adding cool hues to an area, so long as you have a LOT of area for it take over. Luckily, catmint can be pruned back heavily any time of the year. In fact, pruning hard during the summer will result in a full reflowering! In the fall, you can cut these back to as low as a few inches from the ground, but you’ll have a hole in your garden until they flush back in the early spring. More modest cuts of about half the height of the plant during the fall is recommended if catmint is a foundation of your perennial border, couple that with a regular summertime pruning program and this plant is a win/win. if you leave the foliage on these plants to overwinter, they’ll offer you an unattractive but free mulch. If you want to plan ahead for an easier springtime clean up, cut back the foliage of the daylily in the fall to save yourself a headache in the future. Cut the foliage to within inches of the ground. I’ve always been a fan of the native flower, even with it’s not-so-affectionate common name is “ditch lily”. You can leave the fall-blooming anemone standing over the winter, but if the foliage and stems turn black after frosts they should be cut to the ground once that happens. Another victim of “too much fungus!” the peony is a gorgeous bloomer that leaves an often unpleasant heap of fall foliage. Most gardeners are chomping at the bit, ready to prune these guys back at the first moment. Wait until the first hard frost, then cut the leaves back to the ground. An ever-present feature in so many of our perennial beds, salvia offers multiple encores of blooming and attracts both hummingbirds and honeybees! There are so many varieties now, but fall care is the same for all. Woody salvia (May Night, East Friesland and most likely the ones you have) should be cut back regularly throughout the season by removing spent flowers, and does best when it receives a heavy fall pruning, reducing the size of the plant by about half. Similar to Catmint, the aggressive summer pruning encourages repeat blooms during the entire season! A beautiful plant to have in any garden, veronica is an easygoing perennial that requires minimal care. After the first hard frost, cut veronica (aka speedwell or gypsyweed) back to a few inches above the ground. It’ll bounce back happily in the spring. A favorite and necessary addition to any perennial border, yarrow offers a unique flower shape and some interesting foliage. These respond very well to fall pruning, cutting the plant back to the basal leaves. Amsonia, also known as blue star, prefers to be thrown into a high-sun environment where it can go wild growing. Leave these standing over the winter to add some interest to the garden and encourage self-seeding. Another icon of meadows and roadsides in the country, aster is a tough plant that wants to be left alone over the winter. Allow it to enjoy the snow and the cold while adding some cold-season interest to the garden. For whatever reason, aster thrives on being left alone over the winter. This lovely perennial comes in many varieties but the New England Aster (Symphyotrichum novae-angliae) is our hands down favorite. I would have voted for astilbe if it ran for president. Astible’s delicate and uniquely colored foliage pairs so well with it’s spires of colorful flowers. Better yet, it’s a plant that requires minimal care and maintenance. The old foliage helps protect the plant from winter damage and requires minimal cleanup in the spring. Beautifully hued and delicate flowers adorn these beauties. Balloon flowers grow well in clumps, and are eager to self-seed. This means that it’s best to leave balloon flowers standing throughout the winter. They also add some interesting winter form to your garden! If you have somebody close their eyes and imagine the first flower that comes to mind, chances are that it’s a black eyed susan. Wonderfully reliable and eager to take root in many places, black eyed susans are also vigorous self-seeders. If you leave them standing in the winter they’ll offer a food source to birds. Clean up the debris in the springtime. An icon in the garden, butterfly bushes offer a wild growth habit highlighted with brightly colored conical flowers. Leave these standing over the winter, and watch for the first signs of new growth popping out before cutting this vigorous plant back to a height of about one foot in the spring. Yes, I just told you to cut in back from the four to five foot height it achieved last year to one foot this spring. The hard cut back keeps this plant neat, clean and dense. Otherwise you’ll have a wild, weedy looking giant blob by late summer. Butterfly bush grow so fast that they can easily outgrow their home. Cut it back! Although there are a tremendous variety of coneflowers out there, most of these hybrids seem to revert or reseed back to their true purple color. That’s no problem, because these long-lasting flowers are vital food sources for various types of of wildlife over the winter months. Leave them standing and enjoy their snow-capped flower heads being pecked apart by eager birds in need of a meal. Coral bells are a great companion to many perennial plants and can even stand on their own in the interest department. However, they are prone to ground heaving, when the frost pushes a plant up and above the surface.Leave the foliage intact on coral bells to guarantee an extra level of protection from the cold. A perennial tolerant of just about any harsh conditions you can throw at it, coreopsis is one tough plant. Leave the flowers and foliage intact over the winter. Also commonly known as calliopsis and tickseed, coreopsis prefers being undisturbed until springtime. Once spring has arrived, clean up all the dead plant material right to the ground. The icon of summertime, it’s important to recognize the difference between Montauk daisies and Shasta daisies. Montauk daisies (Nipponanthemum nipponicum), which generally open later in the year, like say October – November, should be treated more like a woody shrub than a perennial. Leave them alone over the winter and only cut back dead stems in the spring. Shasta daisies (Leucanthemum × superbum), on the other hand, respond better to being left alone over the winter, and then having last year’s growth removed in early spring. Dianthus barbatus or Sweet William is a common variety. You can usually leave this softly-hued perennial alone during the winter. These don’t produce much in the way of foliage or mess, and will only require a quick and light cleanup in the spring. Cut liatris (aka blazing star or gayfeather) back to the ground in the winter. Liatris are a bulb type plant like an asiatic lily and so they will also benefit from a good fall feeding. Probably the most well-known plant to have in a shade garden, these are sometimes referred to as plantain lilies. Hosta is a vigorous and incredibly hardy perennial. I’ve dug them up and divided them in July, then sipped a cool mojito and admired their blooms in August. Still, a hosta prefers to have its leaves left alone over the winter, to serve as a mulch for the roots. Remove the old, shriveled material in the spring to make room for new growth. Let’s be honest – if a plant has the word “weed” in its name, it probably doesn’t require much care. Lucky for us, Joe Pye weed is also an eager self-seeder, and offers lovely foliage that is beloved by local wildlife. You can let Joe Pye weed stand throughout the winter and cut it back in the spring… or you could leave it standing. Joe Pye don’t care! Watch out for those spiky flower stalks on this silver-hued, low-growing perennial! Lamb’s ear is just as easygoing in the winter as it is the rest of the year. You can completely ignore it over the winter, and give it a quick cleanup in the springtime. Like a handful of other perennials on this list, lavender is more sensitive to soggy soil than it is to the winter cold.To ensure that this fragrant staple in that sunny corner of your yard makes it back next year, wait to prune it until after the last hard frost, to protect new growth that is particularly sensitive to the cold. After coming up with a plant list for this guide, I’ve realized how much I love the silvery-blue-hued perennials, and Russian sage is at the top of that list and it’s also one of the most commonly asked “how to care for” perennials we get quizzed on at the store. If you have room to let this guy grow, it will provide a beautiful and reliable wall of blue every summer. Like lavender, the new growth is sensitive and does not react well to winter cold. Wait to cut back until after the last hard frost, or when you see new growth starting in the spring. With a tough common name like “stonecrop,” it’s no wonder that these guys like to be left alone in the winter. Lucky for us, they offer some winter interest in the garden. Sedum is one of the first plants to push out new growth in the spring, so when you see those new rosettes forming, you’ll know spring has sprung. So there you have it, a handy guide to Perennial Cutbacks! Have something in your garden that’s not listed this guide? Come in a speak with us, and we’ll help you out! Fall is Fantastic so get out there and prune something!